NordVPN is a versatile and well-recognised provider that delivers strong online protection as well as unrestricted access to the web. Among key features, its no-nonsense, high-speed network of anonymous servers is an essential, multi-purpose tool for anyone using the internet or mobile data. The company is a division of Panama-based Tefinkom S.A., who have been specialising in web hosting and numerous other net solutions since 2008. This is, no doubt, a big plus for the company and for anyone curious about the level of expertise behind the service’s encryption. Our experience in reviewing providers tends to show that companies with multiple IT-based ventures are very dedicated and attentive to their security. Like all serious contenders in the VPN market, NordVPN offers customers several useful ways to use their account, and one of the key aspects of this service is the ability to encrypt your traffic. For anyone who’s not familiar with the concept, encrypting your data is a must when using unprotected, open WiFi hotspots, accessing online banking, making purchases and generally keeping your web activity confidential from internet service providers. On top of that, NordVPN does not store any traffic logs on any servers, meaning your internet data is anonymous, exactly like it should be. Equally as importantly, NordVPN allows you to unblock geographically restricted websites/services such as Facebook, Netflix and Skype. By connecting to one of the many available server locations, your IP address is swapped for a new one, making it appear as though your computer or device is based in another location. As we have already mentioned above, the content of your traffic is safely scrambled behind complex encryption algorithms, imposed by your chosen VPN protocol, of which there are three to choose from – PPTP, L2TP/IPsec and OpenVPN. NordVPN is compatible with all operating systems, but they also offer a very convenient app for Windows users. Unlike with some applications, downloading NordVPN software took us less than a minute, The app is compact enough to launch as quickly and discreetly as a widget, without the need for an actual installation, making the setup process extremely straightforward. After entering our VPN login, we selected the necessary server; clicked ‘Connect’ and our VPN connection was up and running. Although PPTP and L2TP protocols are available to use over a semi-automated launcher on their website, the software itself is already pre-configured to the mighty OpenVPN protocol, with the choice to switch between TCP and UDP sub-protocols. Moreover, further options include the ability to connect via a double VPN server, automatically combining two locations (Austria and Netherlands), with AES-256-CBC, multi-node encryption. This is followed by servers optimised specifically for Tor, streaming and even concrete protection against DDoS attacks – ideal for gamers and online broadcasters. We particularly liked the fact that hovering the cursor over a server, displayed its designated purposes, for instance, showing which one permits P2P transfers, which one unblocks regional streaming services and so on. This simple, yet useful feature is often overlooked by VPN providers, causing confused customers to dig deep in FAQ and T&C sections in attempts to figure out acceptable usage policies. Without a doubt, a small input of detail like this, means valuable time saved as well as avoidance of suspended accounts. Testing out of Europe, we would normally expect a significantly slower connection from a server on another continent. However, this anonymous node in New Jersey demonstrates that connecting to the US will return a very satisfactory performance in the region of 7 Mbps. Another point to consider, is that the connection was established over OpenVPN, which can often be outrun by PPTP and L2TP, should you need slightly faster speeds. Although this was the slowest result of the three, all potential users must remember – the closer you are to the server, the faster your VPN will perform. 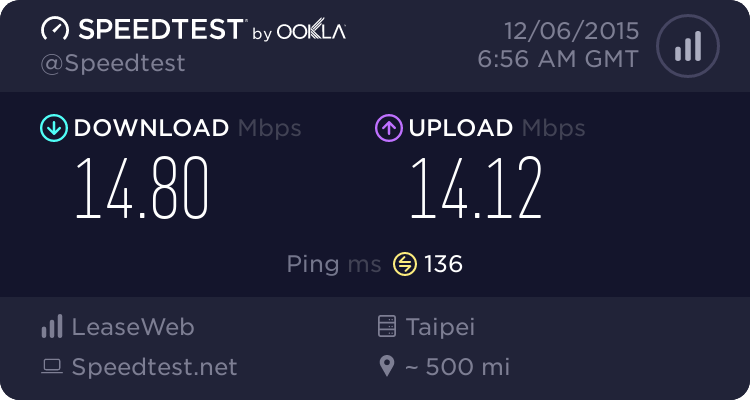 This is why 4.50 Mbps is a very respectable speed for downloads, despite the geographic distance, and we would definitely recommend this server for users in Asia, connecting out of locations such as mainland China. Update – In March 2015, NordVPN launched its own private domain domain name servers. These serve customers with the much recommended option to prevent DNS leaks from exposting their real IP address over untrusted networks. The new DNS IP addresses are provided on request from their support team and will soon become available as a built-in option within NordVPN software. In addition to full anonymity, the NordVPN website also features free HTTP and SOCKS proxies, with an enormous selection of proxies to choose from. Nonetheless, keep in mind that there is a drastic difference in levels of security between VPNs and proxies. Proxies do allow for quick access to the web through another country, but your traffic remains out in the open. So if you require full anonymity alongside freedom of access, VPN is undoubtedly the recommended choice. If you’re searching for a reliable VPN with a strict no-logging policy and great speeds – don’t look past NordVPN. This provider is an established player on the VPN scene and continues to grow in popularity with each day. Whether you need your VPN for masking P2P traffic or protecting online streams from malicious attacks – you will have it all included under one affordable account. I tried to use NordVPN it last Saturday. It was a horrible, horrible experience. Download speed was slow and often dropped to zero. Some websites not loading until I reconnected. I tried various servers. Some of which disconnected me after being connected for a while and then told me my credentials were no longer valid. I used both the application as well as the OVPN file. I am now using another vpn service and things are much better. Based on my personal experience I don’t understand the positive comments at all. 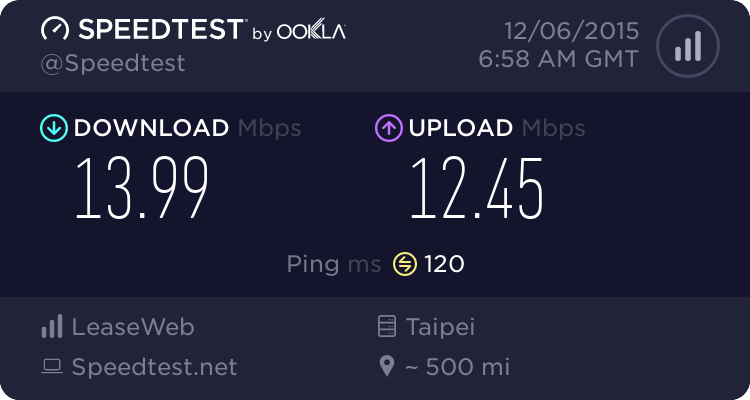 I’m a user from Taiwan, my ISP is HiNet at 100M/50M speed without VPN, paid VPN services like VyprVPN, Express VPN. 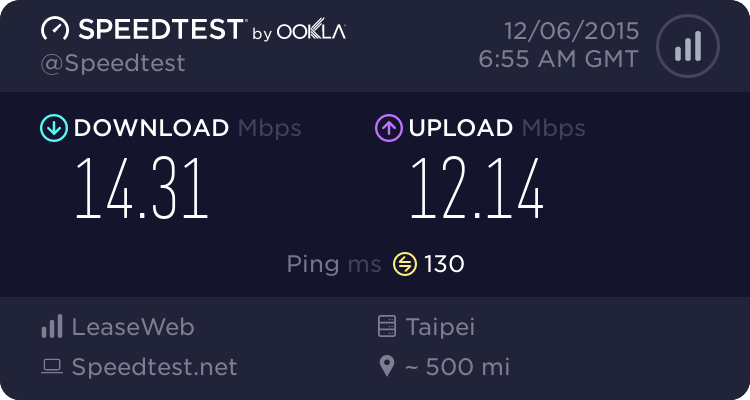 For speed, VyprVPN got the best overall, but they DON’T allow P2P traffic downloading when using Xun Lei. 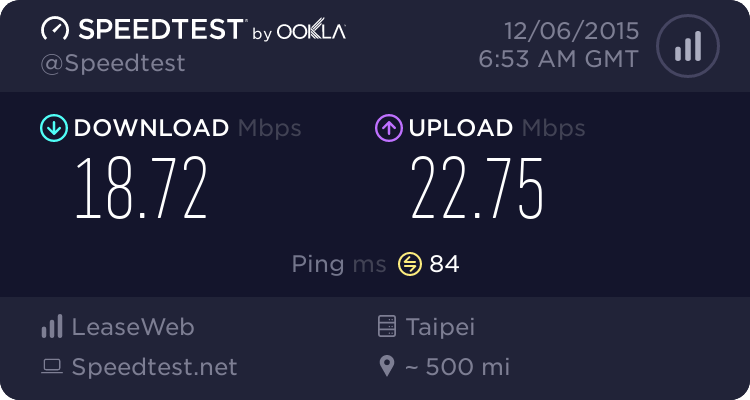 ExpressVPN got worse speed in my test even connect to Taiwan server or Hong Kong server(a little better than Taiwan). 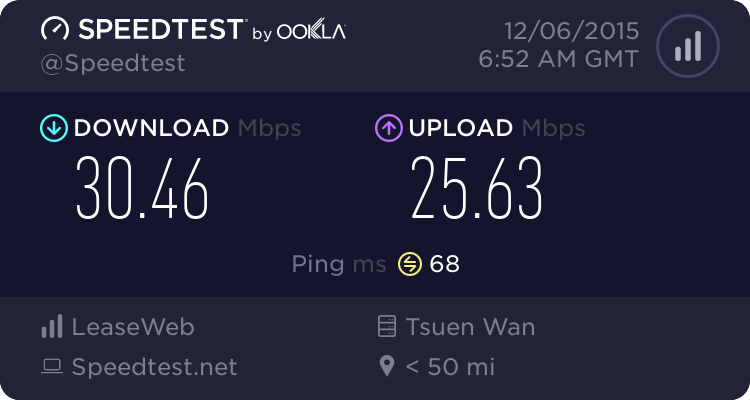 Finally I found NordVPN, they don’t have server at Taiwan, the nearest(best ping around 60-70ms) server is at Hong Kong. They got the same speed as VyprVPN and DO allow P2P traffic(Hong Kong is not a P2P allowed server but it works) which is awesome for me. The only con is iOS app of NordVPN doesn’t as good as VyprVPN. It only teach you to install VPN, change server here is a pain. Hope they can improve the app in the future. In these days, I tried to compare NordVPN with other VPNs like SaferVPN, Proxy.sh, TigerVPN, however they do have some limits when using trial or basic plan. So I compare the servers which the trial or basic plan provides with NordVPN. Eventually, NordVPN beats all over them when comparing on same locations like US(NY, LA)/Netherlander/HongKong by using SpeedTest. As a conclusion, I’m very satisfied with NordVPN. Got one more thing to tell, I paid 1 month for $8 to trial and found it is good for me, then I contact support to get refund and tried to get 1 year discount for $36. The support said I don’t need to refund, they will give me one more month for FREE as a equal after I bought the 1 year plan. Great live online support! So I’m now happy surfing with my 14 months plan! Thank you for sharing your feedback on using NordVPN and other VPN providers and glad to hear first hand that NordVPN offer good customer support. Also, thanks for sharing results of your NordVPN speed tests. It’s good to see that NordVPN’s Hong Kong server supports good speeds. Were these speed tests conducted using OpenVPN or other protocol/s? If that was OpenVPN, those numbers are especially impressive. great to hear such a positive review about our service! We really appreciate that you are with us. We do our best to introduce new servers in the region to provide even better experience! I’ve been using NordVPN for 7 Days and so far it’s working well. The application is great besides some very minor hiccups but not with the Servers…just the app will hang and need to be Forced Closed, the customer service is great, and the fact that I can trust NordVPN with my privacy is the greatest. I have been doing extensive research before investing in a VPN and took me many years of observation of how the company rolls…are they ethical…are they trustworthy…and yada yada. If you’re going to be utilizing a VPN…make sure your internet speeds are at least 10+Mbps/2+Mbps to appreciate the speeds of the servers speeds you are connecting to. NordVPN has a loyal customer and user for life as long as they don’t disappear. NordVPN seems to be working fine. IP change works correctly and speeds on local servers aren’t too bad compared to my last VPN. Glad that you’re happy with the service Mike!